Crypts and Things review, by José Sánchez in Spanish. OPENQUEST 2 is GO! GO! Just under two weeks of the IndieGoGo.com preorder left. Pick up has been outstanding and we’ve reached four out of five stretch goals. A new version of OpenQuest 2 expanded to be the IMPERIAL EDITION. Tidied up and reorganised rules, to remove any remaining ambiguities. All internal Clip art replaced, existing art improved and new art added by artist Simon Bray. Blood Magic for evil magicians. Straight forward rules for Relationships by Simon Bray. At least ten New Monsters. Plus other small highlight boxes, containing explanation of current rules for the first time D100 player or Games Master. More setting info for the Empire of Gatan. Because we’ve reached the stretch goals for them all preorderers will get. OpenQuestRpg.com – a hub for all OpenQuest activity, including the extended family of OpenQuest games (currently The Company and the upcoming River of Heaven), with forum, online SRD for reference, as well as a members only area with exclusive preview material and playtest material. All pre-orders no mater the level get members access for a year. The final stretch goal , a book of OpenQuest Adventures, is in sight, and all preorders will get a pdf copy (with the option of a printed version) way in advance of general release. Remember its the final two weeks. If you don’t preorder now you are going to have to wait until the game goes on general release in Feb to grab a copy and will miss out on the free shipping and extras (so no free printed version of Basics if you don’t preorder the printed version, and no free year subscription to OpenQuestRPG.com ). Ladies, Gentlemen and Wild Things of all ages, I am proud to announce the Crypts and Things UK Masters Series of adventure modules, coming from D101 Games starting in late 2012 with modules coming every month or so throughout 2013. The Masters series will highlight the work of some of the best adventure writers in the UK today. Here’s the current line up of eight Masters. Simon Bray, one half of Unspoken Word team who brought out numerous Gloranthan adventures/settings in the 90s/00s and co-author of the upcoming Here be Dragons setting/adventure pack for OpenQuest. Scott Dorward, infamous convention gamesmaster and horror aficionado. Neil Gow, author of the Napoleonic storytelling game Duty and Honour and its nautical sequel Beat to Quarters, which goes out via his small press imprint Omnihedron Games. Paul Mitchener, author of Blood of the Gods for Wild Talents published by Arc Dream publishing, co-author of the upcoming Here be Dragons setting/adventure pack for OpenQuest and Age of Arthur an upcoming FATE game to be published by Wordplay Games. Phil Harris, convention games master of numerous years and organiser of Conpulsion convention held annually in Edinburgh. Mike Mason, part of the team that put Dark Heresy together, and co-author of the upcoming Call of Cthulhu 7th Edition, ex leader of the Kult of Keepers. John Ossoway, author of Cthulhu Rising, co-author of The Savage North for OpenQuest and the upcoming Hard Sci-fi game River of Heaven. 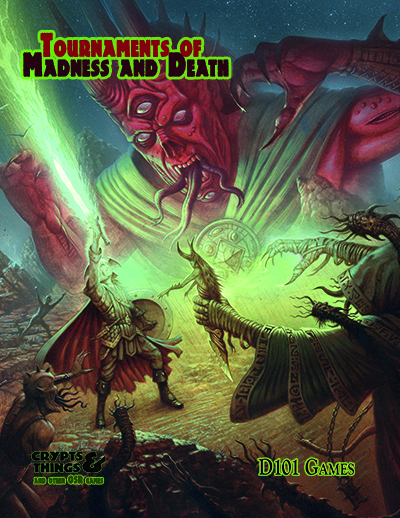 Each Master will produce one 20-40 page adventure module for Crypts and Things, drawing on their intimate knowledge of the games’ Sword and Sorcery heritage, both literary and gaming, to produce a gaming experience full of surprises, thrills and chills for a variety of settings and level ranges.